Hellooo! Today, I’m talking about a recipe inspired by my French culture and it’s awesome! What’s so great about that recipe? So many things! – Kids and adults love it. – Meat lovers and vegetarian eat it. – You get to eat your green. – It’s perfect for dinner and makes a great lunch for school or work. Saying it’s inspired by my French culture is not totally right nor fair… to my son! My little superhero loves to watch Popeye and asks me regularly to buy spinach at the grocery store. I know, I am a super lucky mom as not all the kids asks for spinach, broccoli and green beans at the store. Thanks to the episodes of Popeye on Youtube, we made spinach version of lasagna or transformed quiches into spinach tarts. When we do crêpes at home, I love the atmosphere, it’s relax and we each choose what we want in our crêpe. I used to have dinner like this with my Dad when I used to live with him in France, it was our French version of breakfast for dinner. As a Mom, it’s a privilege to pass along some evening’s tradition and make my souvenirs their souvenirs. Those crêpes are the Popeyes crêpes like my son calls it, it brings color to your plate and stimulate your originality. What do you want in it? Veggies? Ham? Cheese? And egg? At home, we go simple with ham and cheddar cheese, fresh ground pepper and salt. 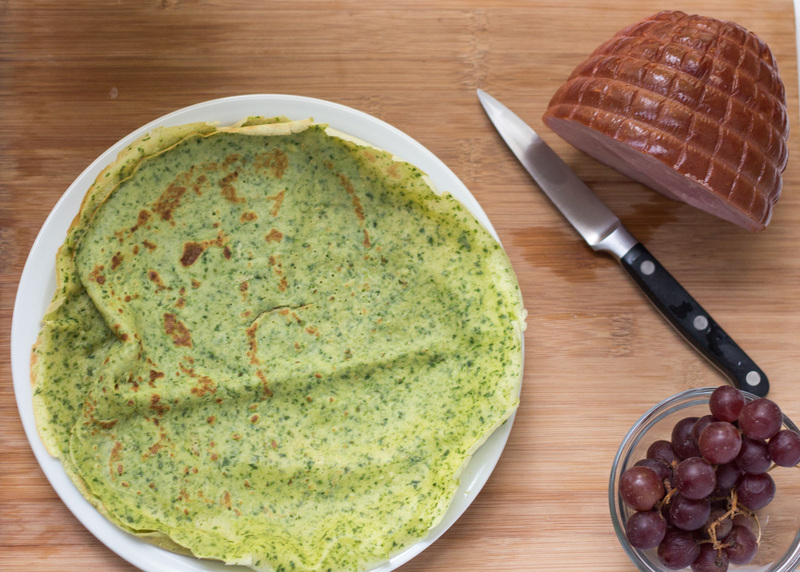 Something we love to do is the split the recipe in 2, save some spinach-free batter to make some sweet crêpes for dessert. Chocolate crêpes anyone? Or would you go for the traditional French melted butter, sprinkle with sugar and a zest of lemon. - 4 full cups of spinach leaves, washed. - 1/8 of a cup of vegetable oil or melted butter. -In a blender, put the eggs. Blend to whisk them. Add the flour. Blend. Add the milk. Blend. It should be the consistency of egg nog. - Add the spinach and the salt. Blend until the spinach leaves are mixed in the batter. - Warm up your pan, grease it with a paper towel dipped in a little bit of oil or melted butter. - Pour 1/2 a cup in our crêpes pan, spread it by moving the pan so it is covering all the pan. Turn it when it is cooked and starting to golden. - Grease and repeat until all the batter is finished. 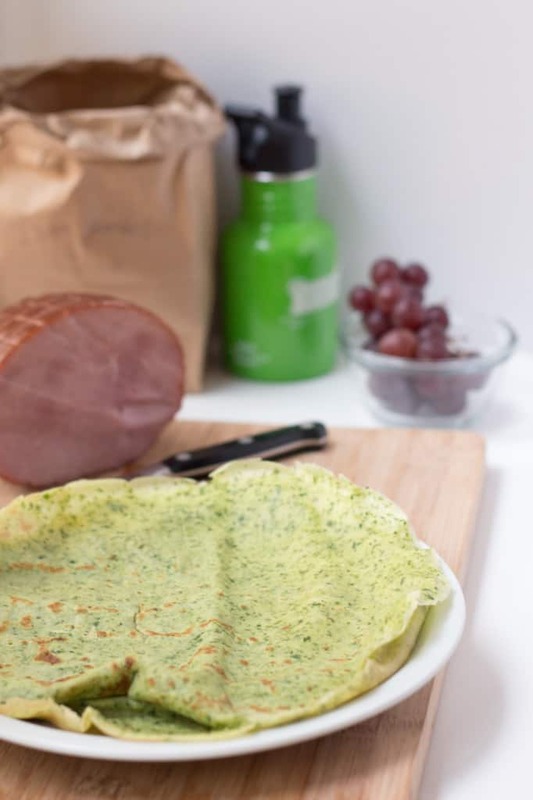 - Fill your crêpes with what you love: ham, cheese, veggies, sunny side egg... the sky is the limit! YUM! 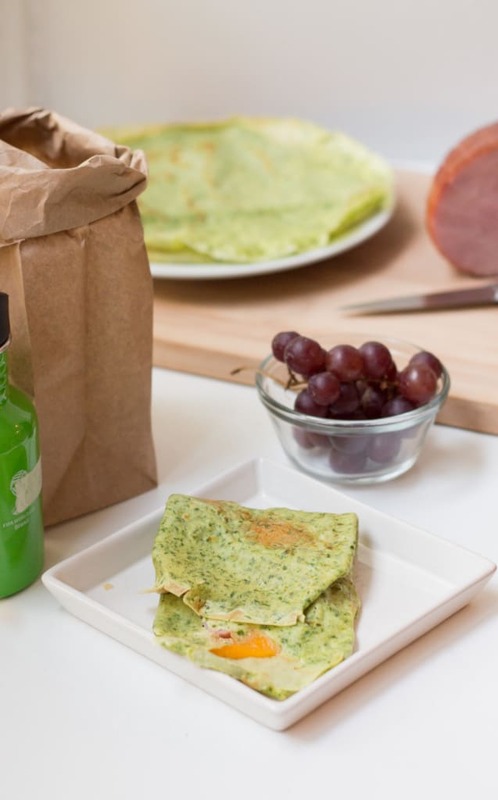 I had both sweet and savoury crepes that were amaaaazing when we visited Montreal – don’t know why I’ve never made them at home! Try it Anna, it is so simple, all ingredients in the blender and voila! Kids love it too! Delicious if you ask me. I sometimes have issues when I buy too much spinach, this seems like a great idea to use them before the go bad. Thanks Hector. It’s in fact a great way to use your spinach before it goes bad. Thank you for stopping by “kitchengeek”!